Now in its fourth edition, this hallmark text provides a comprehensive, article-by-article guide to the workings of the CMR Convention, as incorporated into English Law by the Carriage of Goods by Road Act 1965. This new edition is fully up to date with all major UK case law, plus major developments in the interpretation of the Convention in the case law of other Contracting States. Furthermore, the book includes expert guidance on the amendments introduced by the additional protocol concerning the electronic consignment note of 2008. The relationship between CMR and potentially conflicting legislation, in particular the Judgments Regulation of 2001 and the Judgments Regulation (recast) of 2012, are also usefully examined. Praised as well-written and extremely accessible, Messent and Glass offer a level of expert detail and referencing that cannot be found elsewhere. This work is an invaluable reference tool that can be used by the busy legal practitioner, and by other road haulage industry professionals, in any contracting state, to solve the issues that confront them in daily practice. 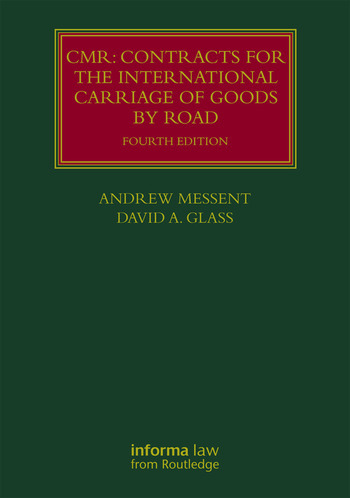 It is also an indispensable guide for academics and students of the international carriage of goods by road. Andrew Messent is a Partner at Gateley PLC, London.